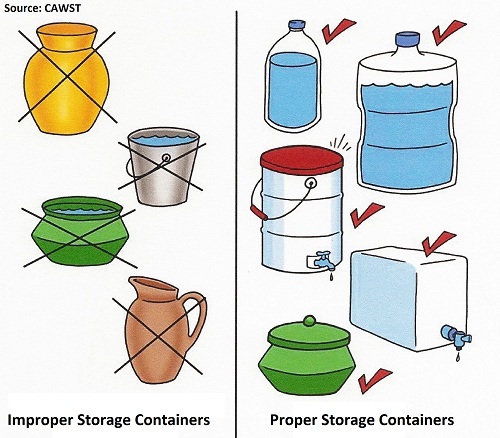 Water storage containers are found around the world in all shapes and sizes. Most larger communities will have a merchant or dealer who can sell some type of acceptable water container. * Tap or narrow opening. Narrow openings prevent dipping into the container with a ladle or device that is unsanitary and can contaminate the water inside the container. Sometimes it is difficult to find or buy a good storage container. The most important things are to make sure that it is covered and only used for treated water. Return to "Water Treatment" from "Water Storage Containers"